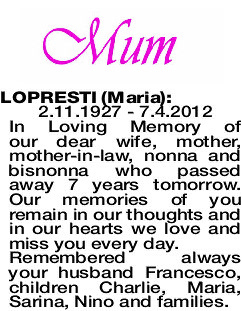 LOPRESTI MARIA 2.11.1927 - 7.4.2012 In Loving Memory of our dear wife, mother, mother-in-law, nonna and bisnonna who passed away 7 years tomorrow. Our memories of you remain in our thoughts and in our hearts we love and miss you every day. Remembered always your husband Francesco, children Charlie, Maria, Sarina, Nino and families.